The Little Changes Make it Special…..
Last night I was asked, “How many different food and recipe blogs can there be?” I can’t even venture to guess how many there are out there right now, but that shouldn’t even be the real question. The real question should be, “How many GOOD and MEMORABLE food and recipe blogs can there be out there?” I was also asked, “How many of the same type of websites can there be before recipes and information keep getting repeated?” Another very valid question, but that is kind of like any website, or blog, no matter what the subject matter might be, and the answer will stand the same, “There will always be the same information popping up over and over, but it will be presented in a different manner that may be more likeable, and understandable, than another site. Even if the information is only different by the slightest bit it may reach people just a little bit differently than the site before it… which will make that site and recipe special”. This recipe I am sharing is a very good example of how many times the same information can be shared over and over, but be altered just enough to make it that much better. I love banana bread, and it is such a comfort food that it warms the entire house when it is baking. The smell brings mellow thoughts to mind, the tastes can bring back special memories, but for those of us who like to eat more than the tiniest slice it’s important that all of those wonderful experiences can be taken and put into a little loaf that can be enjoyed…. When I say that I mean the entire loaf! 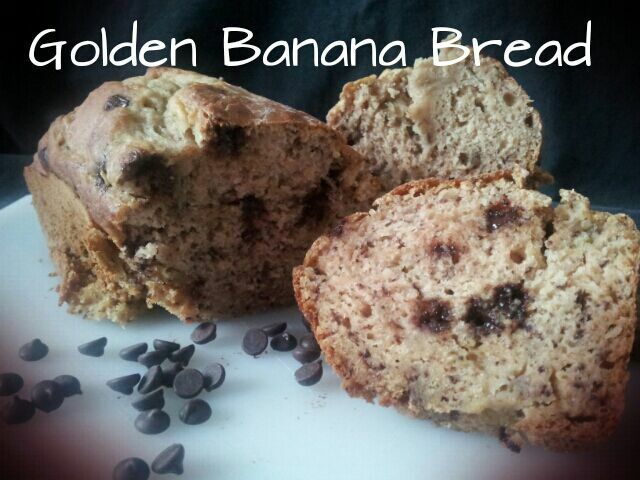 One mini guilt free loaf that is just filled up with warm banana goodness, zero refined sugar, and a spongy moist texture that brings all of the other banana breads that have been tried to the fore front asking why this little treasure took so long to show up. When I took the loaves out of the pan I thought they looked a little rustic, maybe heavy, or dense, but after they cooled and I cut into them I was pleasantly surprised that all the flavors came bursting through in a beautiful little cake. Fold bananas together with egg whites, apple sauce, Truvia, and vanilla. Add dry ingredients. Gently add mini chocolate chips and/or walnuts if you choose. Pour into well-greased/oiled mini loaf pans. Bake at 350 for 40-50 minutes or until a nice golden brown and a toothpick can be inserted into the center and removed clean. Let sit for 5 minutes and turn out onto cooling racks. Let cool completely before slicing. oh, my this looks so yummmmy! just saying hi and well done!